Ending poverty is a great step at improving human rights. This is one of the missions of ActionAid, an organisation that is active in ending poverty and promoting human values. 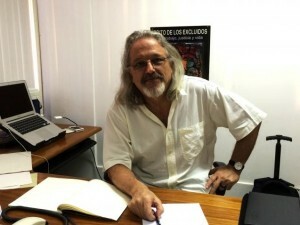 Jorge Romano, the Executive coordinator of ActionAid Brazil talks up the various approaches at improving on human rights as well as the challenges in demonstrating them. He equally talks up on human rights at the organisational as well as international system…..
ActionAid describes itself as “A global movement of people who work together to promote human rights and overcome poverty.” Can you explain what human rights means to you? Along the past 4 decades, ActionAid has taken different approaches to tackle poverty. As we say in our Rights Based Approach manual: “the trajectory of change for ActionAid has been a move over time from a charity organization to an Human Rights Based Approach (HRBA) approach to development. In developing its HRBA approach, ActionAid builds on the idea that human development is the central concern of development, and takes the lead of the famous economist Amartya Sen, who defines development as a process of expanding the freedoms people enjoy. So, our HRBA is an approach to development that centres on supporting rights holders to organize and claim their rights and to hold the duty bearers to account. We analyze and confront power imbalances that perpetuate poverty, and we take sides with the poor and excluded to overcome it”. Who would you say is a leader in promoting human rights, and what makes her/him a leader? People use to have the idea of big leaders that raise the issue of human rights in the international debate, and even manage to mobilize others to insert those rights to the public agenda. As a result we have a significant number of human rights recognized at international level but that are not implemented in the day-to-day basis. For ActionAid the great example of leadership in human rights that we need are those people that in their own specific context of discrimination and violence are able to mobilize and articulate local populations and act in network even with other organizations to advocate for the implementation of those rights. In this sense, there are a significant number of social movements´ leaders across the world promoting human rights at a very concrete basis in the day-to-day life. Most of them are unknown. I can give the example of Dona Dijé, a Brazilian rural woman worker, descendant of African slaves, and leader of a movement of rural women who make their living from collecting palm tree coconuts in Amazonian Brazil. Following Brazilian Constitution that states the social function of the land, Dona Dijé – and 400,000 other so-called babassu nut breaker women – struggle for their rights to an ancestor sustainable practice that is to collect the natural resource even if it is in landlord’s private land who make no use of it. There is thousands of Dona Dijé across the world today fighting injustice and not giving up in their struggle for their rights. How do you see human rights manifest as behaviors or actions in the international system? e.g. an international NGO working with your stakeholders and partners globally? I could share one example about it. ActionAid is engaged in a campaign called Safe Cities for Women. The campaign is active in 19 countries and focuses on the end of gender violence in public spaces. It is led by women living in poverty mostly claiming for a gender responsive urban planning and service provision. In addition to the national actions ActionAid also teams up with urban grassroots movements under the Global Platform for the Right to the City to both add a women´s perspective in the advocacy agenda as well as influence the final declaration of UN Habitat 3 Conference to include safe cities for women as one dimension of human rights to the city. Our work involves various dimensions: from empowering poor people locally to understand and influence the institutional design of public policies and the mechanisms for its implementation until work with stakeholders and build platforms to influence the UN agenda. How do you see human rights manifest as behaviors in your organization? Are there policies or procedures that demonstrate human rights principles? Which are these? We have internal norms and procedures that translate our values centered in human rights. In this sense, ActionAid has developed a Human Rights Based Approach that is the basis for staff training and a tool for the work with our partners. Our understanding of poverty is a denial of human rights. Therefore our Global Monitoring Framework is centered in how the poor people lead the changes of this situation. Our theory of change makes us believe everyone has the power within them to create change for themselves, their families and communities. ActionAid is a catalyst for that change. We know we can only achieve our goals by working collaboratively, both locally, nationally and globally – with people in poverty, our supporters, partners and colleagues. In your team, how do you see human rights values being played out? Is there a culture of human rights? If yes, why do you say that? If no, how do you think it can be developed? In our team we put in practice the HRBA through staff training and discussions, selection of staff, and in the daily relations among the people in the organization. We try that all the people understand the situation of poverty as a situation of human rights which leads to the denial of human rights is present in our context analysis and in our action plans and in the direct work with partners and communities. We also try that the narrative of our communications and marketing strategies and images are in accordance with our commitment to put poor people as agency and not reproduce prejudices and stigma. At an individual level, how do you recognize someone who is committed to human rights? How do they behave? Is this something other people can learn? Can ActionAid teach us some of these behaviors? At individual level one committed to human rights shows respect to diversity and fights against the prejudices the majority of us were raised with. If this person is a man, he is aware of his patriarchalism privileges and fights against it. And that person eventually fails in doing that is able to recognize it and change his behavior. The introduction of human rights in our daily behavior is a challenge that we need to face all the time every day fighting against the cultural patterns that we were educated in. Therefore, when a person recognizes his/her mistake and makes a move to change his/her discriminatory behavior, this kind of attitude should be valued and stimulated. On the other side, it´s very important to promote one style of leadership that empower the staff and create opportunities for them to make decisions by themselves and innovate. This implies the recognition of the value of each of the members of the team and gives equal opportunities for all. What are some of the challenges in demonstrating human rights at all these levels (system, organization, team, individual)? how can we overcome these challenges? One of the main permanent challenges is to move from theory to practice. This move implies eventually on conflicts. We need to know how to manage such conflicts in a constructive fashion. Another very important challenge is to deal with the growing intolerance of our current time. Despite that human rights have been progressing in the letter, some would say that the era of rights is coming to an end, and we are beginning to live under a time of fundamentalisms. Intolerance is growing at international, national and local level. This feature that in the past remained hidden it is nowadays proudly present in the streets and in the media. How to face discrimination against migrants, religious fundamentalisms, reduction of the age of penalties, restrictions on women´s rights over the control of their bodies and sexuality, among others, would be perhaps the biggest challenges for civil society at all levels . Finally also another challenge is the negative side of the new social media that promotes the tribal behavior, a style of narcissist endogenic sociability, and an unaccountable violent discourse against the different with violation of human rights. GVI produces publications on substantive issues from a values perspective, and linked to current events on the UN agenda. GVI also solicits and hosts articles by UN system actors, so you can hear your own voice in the conversation. Support us in supporting you. GVI is a tax exempt 501(c)3 organization so your contributions are tax deductible. We invite you to make a safe online donation.